FAREWELL TO THE KING is truly frustrating. It’s romantic, heroic, lofty and rousing. It’s ridiculous, hokey, lazy and redundant. Director/writer John Milius takes his bold flair for un-p.c. 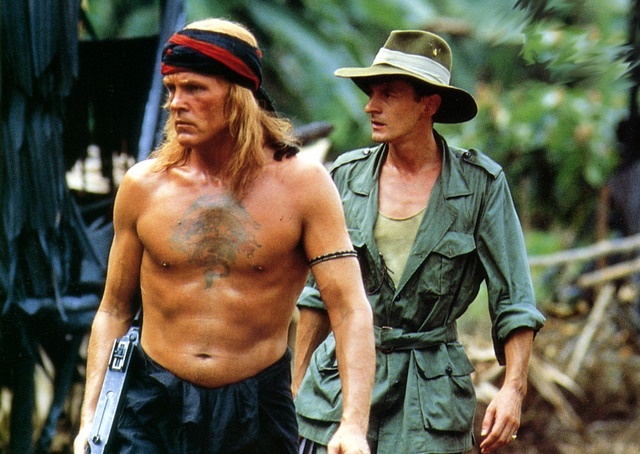 bravado to the jungles of WW2 Borneo (and $20,000,000 worth of production onto locations in Sarawak) fashioning a Kipling/Conrad action epic stuffed with rumination. 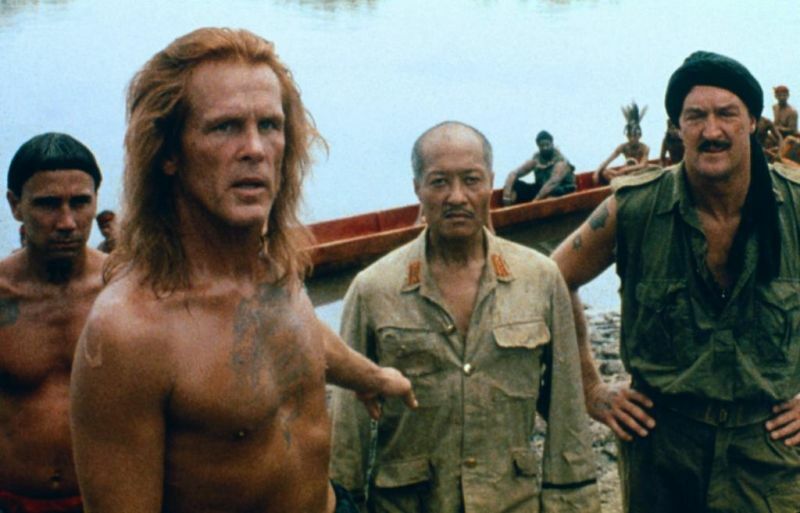 American soldier Nick Nolte escapes the debacle in The Philippines, washes ashore on Borneo. After some ‘that was quick’ perils he becomes leader of a Dayak tribe (like fabled ‘White Rajah’ Brooke). An Allied team parachutes in to convince him to lead his people against the Japanese. Exotic stuff from the High Adventure realm, complete with alluring native girl (Marilyn Tokuda), bloody combat, lush jungle scenery and a wonderful score from Milius’ go-to-genius Basil Poledouris that works to help cover the holes in the plot. There are, alas, a longhouse full of them. Logic wounds of the–‘how could this happen in the time frame’? variety. Attitudinal blisters –‘hey,what a fun war!’ nonsense. Self-inflicted bruises: Milius borrows/pillages from his own wonderful The Wind and The Lion as well as other sources, crafting portentous talk about ‘wind’, ‘destiny’ and other things so Noble they can apparently only be fully appreciated looking down a gunsite or while ducking a sword. Milius fell out with the producers over the cutting, the reviews were dire, and business killed it (just $3,000,000, dying at 130th place). Its 115 minutes do seem shorn (it had been 150) of critical linking material, but even with missing footage there would still be enough ripe dialog to choke an orangutan. Nolte works like a demon: he really gets into it, and does all he can to sell the script, including some clawing rampages through tangled Sarawak jungle that for sheer thespian nerve alone would justify his salary. Nick walks the right line with the purposely old-fashioned speechmaking: part bluff, part wink ,all heart, full tilt. Crucially, he’s not helped by Nigel Havers and some woeful supporting players. Havers is earnest (quite) but has about as much gravitas as a papaya, Frank MacRae’s supposed-Kenyan accent doesn’t work at all (he sounds like a kid in a high school play) and Milius’ wife Elan Oberon might be a nice woman but her deer-headlight delivery is just pitiful. 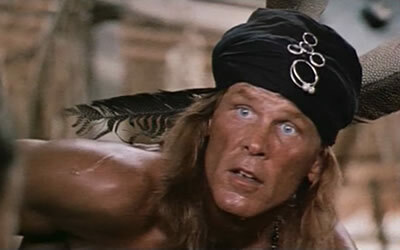 Milius’ steering is diffident (supporting player James Fox said he “may as well have directed from a couch”): some sequences work, others lie there like rehearsals. The energy from Dillinger and Red Dawn (forget the politics) is scatter-shot. I like this 1989 movie. I like the setting, the period, the story and the look. The score alone can get my wanderlust ablaze. I get what Milius was aiming for (well, I think)–an armchair movie-raised warriors pine for the damn-the-torpedoes days of old when “…it just might be…” could still get you gloriously rich—or glamorously dead. It has its fans. You just have to be willing to buy his pose. If you can’t/won’t this is an ordeal. I know people that were moved along by its sweep, sentiment and savagery. I also recall the look of ‘are you what–ten?’ on the faces of others who saw it on my recommendation. Wow, hot native girl with a Lee-Enfield. Sign me up. Both takes fit. To quote Raisuli/Sean Connery from The Wind and The Lion (the directors one undisputed masterpiece)–“Well, maybe I don’t believe it either.” With Marius Weyers, Gerry Lopez, big waves, huge clouds and lots’a shooting.